1314151617181920 years ago this morning, I got up and took a shower. I was very relaxed, all things considered. My best friend Mark was in town and was the first person to sleep on our new couch. I had been living by myself for two weeks in our new apartment. Jennifer was still living with her parents. After Mark got up and got dressed, we headed out and stopped at Chik-Fil-A for breakfast. We were wearing tuxedos. In a Chik-Fil-A. We arrived at Church and I saw Jennifer. As always, she was quite stunning. I remember looking out the window of the Church and seeing friends arrive from several different states. For the first time in my life I saw friends from South Carolina walking next to friends from Ohio who were walking next to friends from Georgia. All my brothers and sisters were there, too. It was the last day I ever saw my grandmother alive. It was the last day I ever saw many friends. But for that one day, I was exceptionally happy. And then Jennifer walked down the aisle at the Church and I married my best friend. It was a good day, 13 14 15 16 17 18 19 20 years ago. It was a very good day. 2015 Update: We talked about 20 years of marriage and shared our best advice on episode 103 of our podcast. Check it out here. How beautiful! Thank you for sharing. Congratulations! May you both still be happy together when the great-grandchildren visit! On that day, how did you expect children would impact your life? Happy anniversary, Greg and Jennifer! May God grant you many, many more happy years together here on earth, doing his work together! Happy anniversary! It’s wonderful being married to your best friend. Hey who’s that guy with hair kissing Jennifer? Sorry, nice pics guys. and Happy Anniversary! We just celebrated our 30th anniversary last week (the 10th). Marriage is a terrific adventure. I always tell people that one of the secrets of our marriage is that my husband is always full of surprises – he never bores me (in fact, he surprised me with a lovely ring for our anniversary)! We’ve also learned throughout the years that it’s all those little sacrifices you make for your spouse, making him or her first, that makes it all work. Congratulations you two, and thanks for sharing your lives with us! How beautful! Congratulations on your anniversary. Congratulations!! May you have many more happy years together! AWESOME GUYS! 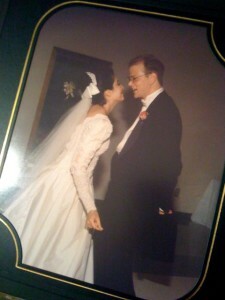 Sue and I just celebrated ten years back on 8/2. I can say this in all honesty, that she has been nothing but a blessing every single day of it! Heck, she’s a SAINT to put up with ME for ten years! :p Know what I mean, Jen!?! WOW! How’s this!?! Responding to my own comment one year later!! Congrats on 14 years together! All the best to the Willits family. May you be blessed with MANNNNNNNY more years of happiness. Three years in a row??? AGAIN a pleasure to finally meet you at the CNMC MMX in Boston this year! Congrats on 15 years in 2010! My wife and I are just a couple of years behind you with 12 back in August. Hopefully, this won’t be the last you hear from me, as I have BIG PLANS w/Fr. Roderick over at SQPN that MIGHT catch your interest, Greg!!! Thank you for all of your inspiration! I knew the big day was coming up and I let it slip by – I’m so sorry! Congratulations on 13, well spent years! ps-beautiful dress Jen, wherever did you find it?! Happy Anniversary and many more years of happiness with each other! Congrats guys!! 14 years, 5 kids, an apostolate, a radio show, a podcast and many many lives touched by your marriage. Thank you guys for saying “I do.” We would all be a little less blessed without you in our lives. Here here to that Katherine! Congratulations to you both on your 14 wedding Anniversary. May God bless you both with many more to come. Congrats, ya’ll. 14 years or 5 kids or the apostolate or the-rest – any of them would be enough for you to celebrate. Put them together and you can declare victory. Happy Anniversary! I wish you many more years of happiness together. We celebrated our 37th anniversary in May. We leave Friday with our son, daughter-in-law and 2 grandsons to visit our daughter in California. Thank you for sharing your lives with us. I loved the show this morning, as usual. Congratulations! And what a beautiful, elegant dress, Jennifer!!! 🙂 Best wishes! Congratulations! Many, many more years of joy to both of you! Ok a little late but still heartfelt. Thanks for sharing your special day with all of us last week. I enjoyed the marriage focus of the show last Wednesday and I wish you both many more years of happiness! Greg and Jennifer – Congratulations on your anniversary!! Way to go – 14 years and counting. If you’ve never read the book, A Severe Mercy by Sheldon Vanauken – I highly recommend it. It is our favorite book and such an amazing story. May the Lord and Our Lady continue to bless you, your marrige and family and your wonderful apostolate. Congratulations on now ’15’ years!!! Many, many happy wishes and more to come for you, the darling couple. Happy Anniversary you two crazy kids!! I have to say, what you said to Jennifer on the podcast was the sweetest thing EVER. I am utterly in awe the true love that you both have. 🙂 Enjoy your day today!